Most children that may benefit from music therapy already receive other therapies, whether at home or in school. 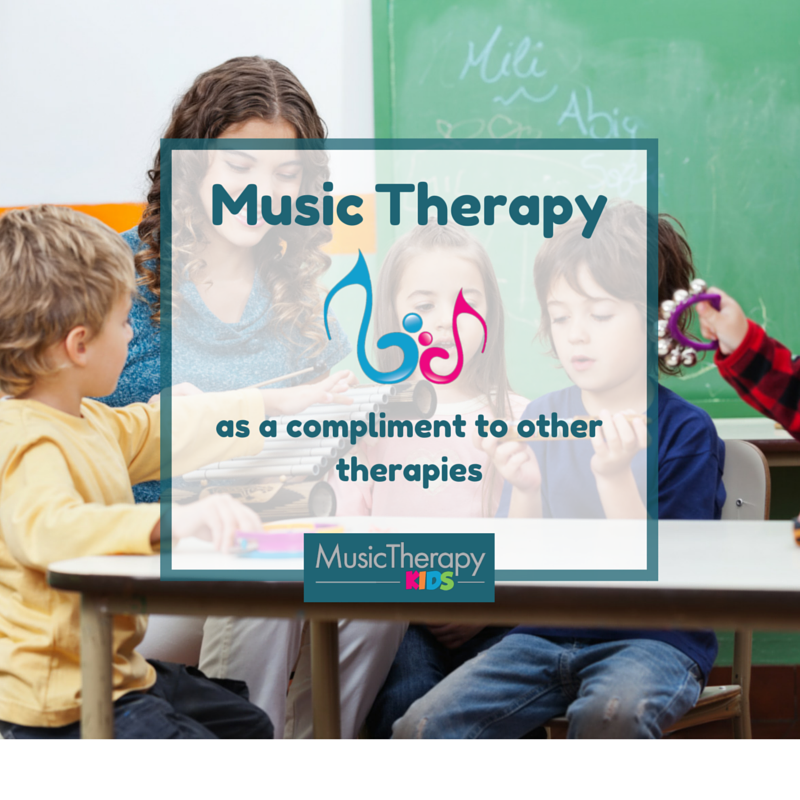 Music therapists can work together with the child’s current therapists to support current goals and to assist children in generalizing their learning. Resources such as the child’s IEP, with consent, are helpful in establishing well-structured treatment plans and consistency among therapists. Music therapy can support children as they learn activities of daily living and improve gross and fine motor control. It brings a multisensory experience as children touch, hear and see the instruments as they interact with the music. Sensory Integration. Many children receiving therapy have sensitivities to sound, touch, taste, smell, and sight. Music therapy easily addresses sound, touch and sight. Many children may benefit from the vibrotactile feedback of hand drums, handheld percussion instruments such as the cabasa and instruments with large vibrating bodies such as the guitar. All types of instruments offer audio feedback and many children may enjoy watching the visual affects of sound such as vibrating strings. Crossing Midline. Interventions using instruments such as the bongos, rhythm sticks, maracas and mallet percussion instruments can be incorporated into treatment plans to address crossing midline. Music therapists can consult with your child’s OT to use interventions most appropriate for your child’s occupational therapy goals. Eye-hand Coordination. Many instruments assist with eye-hand coordination, such as the guitar, drums, pitched percussion instruments and the like. 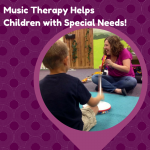 The music therapist may plan an intervention based on OT goals and use instruments that mimic movements used in OT interventions to assist in generalizing your child’s learning. Finger Isolation. Perhaps the most noted instrument to address finger isolation is the piano, which can help to develop fine motor skills. Children may benefit from both structured learning (such as scales, chords and arpeggios) and free improvisation. With both types of learning, children may develop more creative ways of interacting with the instrument which would naturally reinforce dexterity and strength. Articulation. Music therapists are not certified to diagnose specific articulation needs but they may use interventions that can support what your speech therapist is already working on with your child. Singing and speaking with the aid of musical instruments may encourage children to articulate multiple syllables and fill-in words of songs. Fluency. For children who have fluency needs, singing may be an important manner of self-expression and expression of needs. Music therapists may develop interventions to address each child’s specific needs, while consulting their speech therapist. Resonance. Music therapists may create interventions to support needs concerning pitch and volume in a child’s speaking voice. Music may be naturally reinforcing for desired behaviors and elicit novel responses. Behavior Modification. Does your child often have challenging behaviors when it comes to completing certain tasks? Writing songs for a child’s daily routines, dressing and hygiene needs may reinforce positive behaviors. Talk to your behavior therapist about your child’s specific needs and ask your music therapist to write a song! Reinforcement. Music can be a natural reinforcement for behavior. As children interact within a music therapy environment and learn concepts, their behaviors are intrinsically reinforced through the music. Music therapists are trained to observe changes in behavior in order to best reinforce positive behaviors and extinguish negative behaviors. How Can We Bridge the Gap? Consult with your child’s therapists to see how you might work toward common goals together to best support your child’s learning! 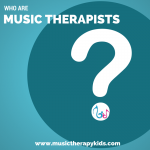 Music therapists are not certified occupational therapists, speech language pathologists or behavior therapists just as other therapists are not board-certified music therapists. These are suggestions for ways to bridge the gap between therapies. They would in no way take the place of treatment plans from specialized professionals. 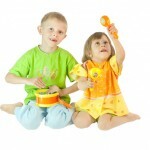 Music Therapy Helps Children With Special Needs! How does music therapy help Autism?